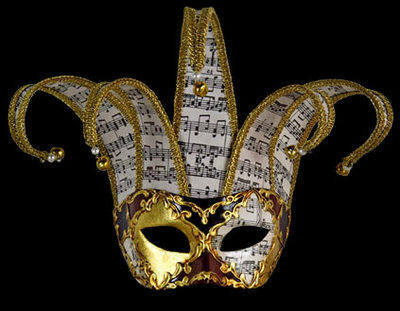 Part of our chic range of statement designs, this fabulous Jester Musica Lux Venetian Masquerade Ball Mask will give every look a designer edge. Bold and eye-catching yet totally seductive, this stunning mask features beautifully painted colours of antiqued gold leaf, deep red and black that are segmented and bordered by golden swirls with aged music scores & topped with 5 points. A must-have addition to your Simply Masquerade collection, this stunning mask will complement every look perfectly. 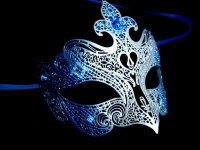 Great masquerade mask for men. 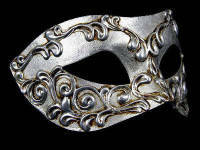 All masquerade ball masks are hand made and painted in Venice. No twoball masks are ever identical. Colours and patterns may vary slightly on each mask.